As a bald middle-aged man who (believe me) no one will ever confuse with a metrosexual, I don’t really place too much importance on which personal skin care ‘product' I use. That said, the brand I've recently tended to use is Nivea For Men. On a business trip to Italy back in the early '90's, I'd forgotten my shaving gel. Recognizing the distinctive art-deco looking blue and white logo as pro cycling's first extrasportif sponsor, I laughed to myself and instinctively chose the Nivea 'Schuma di Barba' can off a convenience store shelf. Since then, Beiersdorf has expanded distribution into the US, building Nivea for Men into a global personal care power brand. They're pumping big bucks into marketing. In UK this year it's around the World Cup. In the US, its TV ad positioning the brand as 'for adults' (vs. Axe as 'for kids'). Ijzeren Briek Schotte. Iron Briek. Stick this great photo by Stephen Vanfleteren on your fridge. Next time the weather's crap, your legs are dead, or you don't feel like going out to ride in the cold and rain, look at this photo. When Briek passed away the morning of the 2004 Tour of Flanders, think cycling lost the laaste of its greatest generation? No doubt. 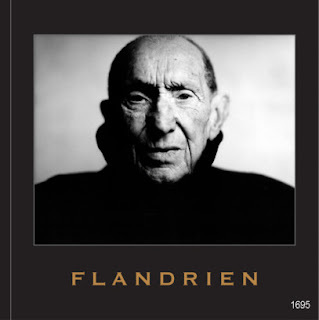 Writing about the Ghislain Lambert film got me on kind of a Walloon theme, what with the Fleche Wallone tomorrow and all. 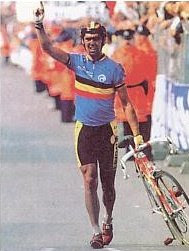 "Ronse, August the 28th, 1988. We're down to the final sprint of the World Professional Championship road race. The local walloon hero, ex champion of the World Claude Criquielion is there with Canada's Steve Bauer, and unknown Italian Maurizio Fondriest. They go together under the kite. They're just off the front and hit the final uphill finish together." Bauer leads it out. Claudy tries to squeeze by on the right between the narrowing barriers and an elbows out Bauer in full flight. Oh no.... I see some illegal contact dandy Don..."
"Down goes Criquielion!... Down goes Criquielion!" Flandria Cafe wielersupporters topfavorite: The 2001 Franco-Belge feature film "Le Velo de Ghislain Lambert." This French language film stars Belgian comic actor Benoit Poelvoorde (Man Bites Dog, Asterix Goes to the Olympic Games). Poelvoorde plays the title character in this 'mockumentary' about cycling's unglamorous side- the saga of a humble domestique whose lack of talent is only surpassed by a blind and dogged self belief in his destiny to become a champion. Poelvoorde strikes the near perfect tragi-comedic balance in his portrayal of the luckless Lambert, portraying a sympathetic main character with a modest palmares, but also with a spirit and dreams undampened by the stark reality of the gritty pro peloton. My amateur cycling club - CCB International - has a classic jersey that celebrates its 30th Anniversary in 2010. Its design was conceptualized by the original CCB (the Cycle Club Basingstoke, England) as a replica-copy adaptation of the old GAN-Mercier professional team jersey of 1972-1976. GAN is a major French insurance company who along with old line manufacturer cycles Mercier sponsored one of the top teams in cycling in the early '70's. The equipe was led by top Tour de France contenders Raymond Poulidor and Joop Zoetemelk. 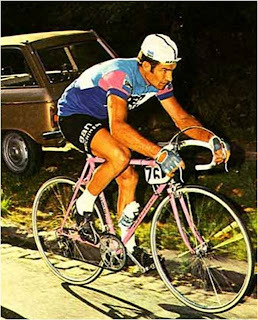 Eternal second Poulidor took the Gan jersey to 2nd in the 1974 tour behind Merckx. And Zoetmelk and Poulidor finished 2nd and 3rd respectively in the 1976 Tour. Tour of Battenkill Saturday, my first masters race. Nothing like jumping in the deep end. 100k of temp in the low 50's , 20mph winds, steep dirt climbs. Add in over a hundred guys age 50+ and old enough to know better. Verdict? Glass half full, half empty. 6oth, but in a group OTB by over 16 min. Not a complete embarrassment...but not to my standards either. The bad news was that I got shelled from the main bunch on the 20% section of Juniper Swamp road about 17 miles in. Just didn't have the leg power to stay with 'em on the steepest wall. After a few miles of solo OTB 'blow-up' level crisis and recovery, I found myself caught by a group of about a dozen that kept chasing hard the rest of the way home.